Botox® is a popular procedure utilized to soften creases and wrinkles caused by loss of skin elasticity in areas of muscle contraction. 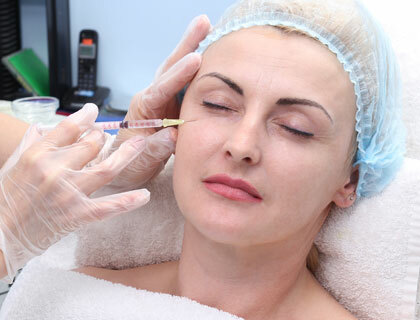 Botox, which originates from the Clostridium Botulinum bacterium, works through “selective muscle denervation.” That is, it blocks select muscle receptors to, essentially, paralyze the muscles that cause wrinkling. From an aesthetics perspective, Botox is most effective in the treatment of lines between the eyebrows (glabellar lines), forehead furrows, crow’s feet and frown lines. The visible effects of Botox are evident within 48 hours of administration, with maximum results achieved in five to 10 days. Botox is not permanent. Rather, in three to five months post-injection, new muscle receptor sites are developed and, thus, muscle contraction gradually resumes. Plastic Surgery Institute offers Xeomin, a generic Botox equivalent, instead of the name-brand Botox product. Radiesse® is a newer, long-lasting injectible filler with the ability to soften wrinkles and fine lines, especially the nasolabial folds that run from the nose to the lips; reduce the appearance of acne scars; restore volume around the cheeks; and enhance or correct asymmetrical facial features. It acts as a replacement to the body’s natural collagen, in areas where collagen has become depleted. A synthetic form of calcium hydroxylapatite, a mineral found in bones and teeth, Radiesse is perceived by our body as a natural substance and, therefore, no significant reaction is experienced. Local side effects may include redness or slight swelling, which typically lasts just a few days.